Redundant quality control processes are in place throughout the manufacturing system to ensure that consistent quality garments are produced at all factories. 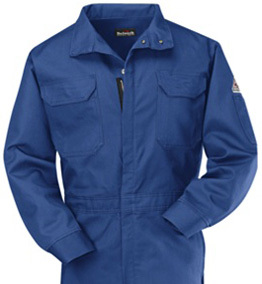 ServiceWear Apparel incorporates the most modern quality control systems for all VF manufactured garments. The following areas are closely monitored and receive internal audits. Pattern and fit consistency is achieved through automated fabric cutting and all factories being linked to a common pattern database. Fabric rolls are cut in the same sequence as produced by the fabric mill. Garment parts from the same fabric ply are sewn into the same garment. Acceptable shade bands are established with the fabric mill in advance and mills are held to these standards. Standards are established for all fabric blends and colors. Employee's pay is tied to the quality of work they produce. Each employee is responsible for inspecting the work of the previous sewing operator. Floating inspectors conduct "in-line" quality checks. Inspectors review 100% of finished garments at the completion of production. Random audits are done on batches of garments. If the sampling fails the audit, the entire production batch is returned to the factory to be corrected. Detailed lab inspections are done periodically to ensure garments meet specifications in every detail. Our quality control laboratory is independently certified and is capable of a variety of garment tests to verify the quality of the fabrics, components and garments themselves. The laboratory has been in operation for over 30 years and is highly regarded by industry associations such as the workwear and Textile Association and the Textile Rental Services Association. Samples of product are routinely audited for fit, color, durability, and comfort to certify that exact standards are maintained. National IPA is a cooperative purchasing organization that reduces the cost of goods and services for participating agencies by aggregating their purchasing power nationwide.